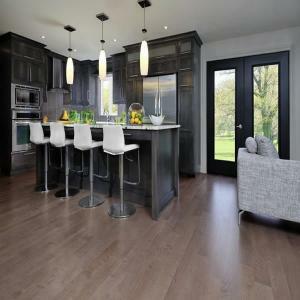 Laminate flooring is a man made material made to look like real wood or natural stone. The fact that it is manufactured makes it a very durable and a well-priced flooring option for consumers. Most laminate products consist of an HDF (High Density Fiber Board Core) and a melamine veneer design layer. This design layer is a picture made to look like wood or tile. These components are pressed together and covered with a very strong transparent and protective layer. This type of flooring product is great for high traffic areas and families with dogs and/or kids.